Saying that social media has taken the world by storm is like saying that rain is wet or that fire hurts—it’s a bit of an understatement. Social media comes in a variety of flavors. You’ve got the vanilla Facebook, the bite-sized dessert that is Twitter, the dish with the perfect presentation known as Pinterest, the on-the-go Instagram, and of course, the zero-calorie Snapchat. These are just some of the platforms people are using today. There’s truly something for everyone, and that’s part of the appeal. There’s something beyond this, though—several characteristics that tie the whole concept together. Here’s the bottom line: There are universal truths about social media that made it so insanely popular. Here are five of those traits. This first point is something that resulted from the sheer power of the internet. With a platform like social media, you can suddenly keep in touch with long-lost friends, meet new people, and do all of it from the comfort of your own home. It’s truly remarkable how connected we all are as a result of these platforms. The appeal there is undeniable. To access anyone, anywhere in the world, is a powerful thing. Another key aspect that makes social media so successful is the way it’s designed. When it comes to user interface, nothing beats these platforms. Everyone from teenagers to grandparents have figured out how to use Facebook. They’ve managed to make it so simple and easy to use that it reaches any demographic. There’s very little in the world of technology that can match that level of universal appeal and understanding. The word “free” is a powerful tool. People will immediately try something if it’s free, which is why these platforms are so successful. They offer all of these amazing features and connectivity without the hassle of paying for it. The secret sauce lies in the advertising costs and paid games on the platform, but the entry fee is zero. Social media extends beyond simple conversation and photos. Networks like LinkedIn offer a professional platform that helps businesses and job seekers connect. This is another example of how versatile social media can be. The options for paid advertising are also extremely varied. Companies can utilize targeted options to reach the exact people they are seeking. The options are practically limitless, which leaves plenty of opportunities for businesses to take advantage of these platforms. Most businesses will be sold on social media marketing, but finding success in this field requires a keen understanding of what makes people share and engage with content on social media. Here are five science-backed psychological elements of social media that increase the amount of engagement on social media. Self-censorship is the word of the day here. We want to limit this, so we can confidently publish content on our social media and blogging platforms. A great way to start is by creating audience personas: specific profiles that outline the traits of your typical user. Whether you’re a solopreneur or you’re posting a photo of your team, you should always keep in mind that people draw conclusions from a photo in less than a second! For online marketers, it may be worth your time to A/B test your photos on social media for this very reason. Furthermore, you should take into consideration the lighting, facial expressions, color, and appearance of everyone or everything in the photo. A fascinating study done by Dr. Stephanie Tobin from the University of Queensland’s School of Psychology discovered that active participation on social media gave users a greater feeling of connectedness. This was due in part to the feeling that people can jump onto social media and have conversations whenever they want. It makes them feel connected to others in a profound way. For marketers, it’s important to understand how this can translate to the conversations and feedback you give and get on social media. As human beings, we love to talk about our thoughts. In fact, Harvard neuroscientists have discovered that being able to share our thoughts triggers the same pleasure sectors of our brain that food and money trigger. This research also showed that 80 percent of social media posts are announcements about a person’s experiences. We can take this and connect it to marketing by focusing our efforts on listening to our users as much as possible. Now that they’ve found their success, use this knowledge to create your own. How do you utilize social media marketing? Let us know in the comments! Editor’s Note: A version of this post originally ran on OnBlastBlog.com. 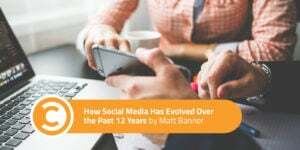 Matt Banner is a digital marketing specialist and serial entrepreneur who finds great pleasure in helping others succeed in the internet marketing and business world.